This quaint little town with its luxuriant forests and hilly environs used to be the summer capital of the Scindia rulers. Here is the Madhav National Park, which not only provides sanctuary to the wildlife but to the avifauna as well. Prior to the royal Scindia?s its dense forests were the hunting grounds of the Moghul emperors when Emperor Akbar captured great herds of elephants. Much later, it was the tiger that roamed the wooded hills and many a magnificent best was bagged by royal shikaris. 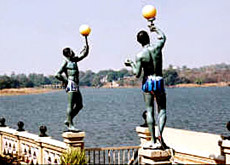 With its luxuriant forests and undulating hills, Shivpuri was the natural choice as the summer resort capital of the Scindias. Shivpuri's royal ambience lives on in the exquisite places and hunting lodges and graceful, intricately-embellished marble chhatris (cenotaphs) erected by the Scindia princes. A sanctuary for rare wildlife and avifauna, Shivpuri has transformed a royal past into a vibrant, hopeful present. The district derives its name from God Shiva. It was known earlier by the name Sipri. The Shivpuri place first found a mention during Moghul times in 1564 when Emperor Akbar is stated to have halted at this place. During that period it formed a part of Narwar Sarkar. It has a very big ancient fort and a wealth of history behind. 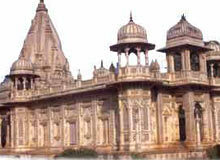 The district was known as Narwar district during the times of Gwalior State, although its Headquarter was at Shivpuri. Shivpuri remained with the Kachhawaha Rajputs upto 1804 when it was taken over by Scindia?s. It was captured by the English in 1817 but returned to Scindia?s next year and it continued to be a part of Gwalior state since then. In 1859 it is said that the great Indian leader Tatya Tope was hanged near the present Collectorate. Maharaja Madhav Rao Scindia paid much attention towards the development of Shivpuri. 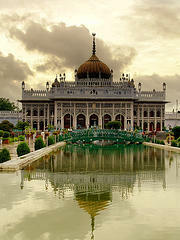 He constructed a big palace and also developed the city. 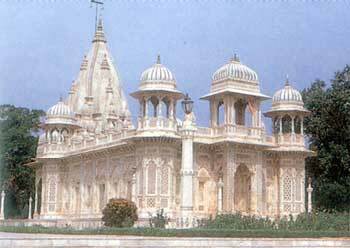 It was the summer capital of Gwalior State and government offices were shifted here in summer months. 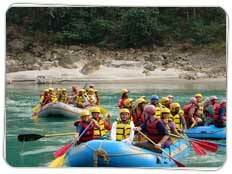 Apart from its National Park Shivpuri is noted for quite a few features? 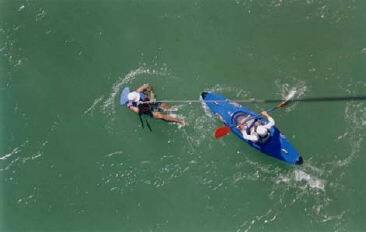 There are four main rivers namely The Parwati, The Sindh, The Kuno and The Betwa, which pass through the district. The Parwati is a tributary of Sindh River and joins it near Pawaya in Gwalior district. It is perennial but not navigable. Shivpuri has a cool and dry climate. 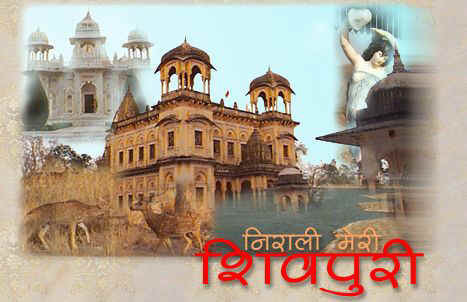 Shivpuri is mainly an agricultural district and so cultivation is the main occupation of the people. The district is much better off in its road communication for it lies 116 kms, south of Gwalior on Agra-Bombay National Highway No. 3 - an excellent all weather road. This road connects the district to Gwalior, Agra and Delhi in the north and Guna, Bhopal, Ujjain, Indore and Bombay in the south. There is no airport in the district. Flora The species of trees commonly found in the district are Khair, Kardhai, Dhow, Salaj, Tendu, Palas, Mahua, Karch, Karey, Saja, Koha, Jamun, Saj.Dhaman Kaim, Semal, Tinach and Amaltas. 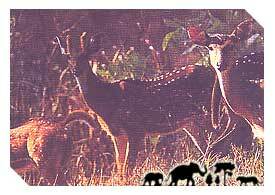 Wild life has been steadily declining in the district, due to indiscriminate shooting and cutting of forests. 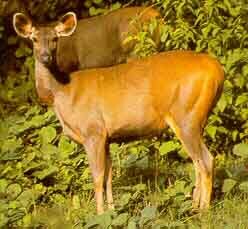 In ancient times the forests were thick and a good number of animals could be seen. The animals found are? Nahar tiger (Felis tigris), tendua?panther (pelis pardus), ladaya jackal (Cummins aurens), lakkad baggha hyena (Hyena striata), Bhalu, Sloth bear (Melxerus ursinus), Sambhar (Carvas unicolar), suar, wild bear (Sus crislatus), Lomdi-fox (Vulpes bengaleneis), Chinkara (Gasells benetti), Kala Hiran?black buck (Antelope cervicapra) and Langur black faced monkeys (Semli petheous entellus). Among the main common birds, the following are found the common Myna, Shikra Hawk, The common Crow, The commons gray house Crow and all black crows, the harival green Pigeon, the Grey jungle fowl, The Mor-Peacock, Jungle bush Quail and bustard Quail. The avifauna also includes the cormorant, paint stork, white, purple sunbird, paradise flycatcher and golden oriole. Spread over 156 sq. 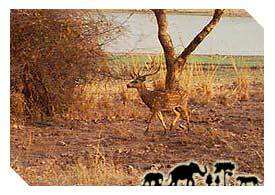 km, the Madhav National Park is a haven for wildlife and wildlife - buffs. The park remains open throughout the year, boasting of large numbers of chinkara, Indian gazelle and chital. The nilgai, sambar, chausingha, blackbuck, sloth bear, leopard and the common langur are the other inhabitants of this sprawling park. Set in an elaborate Moghul garden, are the cenotaphs, the royal chhatris dedicated to the Scindias. Facing each other across a water tank are the chhatris of Madhav Rao Scindia and the dowager queen Maharani Sakya Raje Scindia, in a delightful fusion of Hindu and Islamic architectural styles, with their shikhara - type spires and Rajput and Moghul pavilions. Both cenotaphs house life-size images of the Scindias, attired religiously, daily with flowers and incense. The summer palace of the Scindias, Madhav Vilas Palace, looks intensely alluring, dressed in a soft shade of rose - pink. 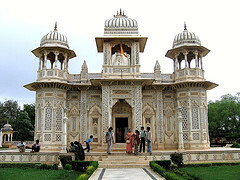 The Mahal as it is popularly known as, is attired with marble floors, elegant terraces and a Ganapati Mandap. Deep inside the park, at its highest point stands the George Castle, built by Jiyaji Rao Scindia. The ideal time to visit the castle is at sunset, when the Sakhya Sagar Lake seems to take on the radiance and changing hues of the sky. Lacing the forest cover of the National Park is the Sakhya Sagar Lake, home to various reptiles like, marsh crocodile, the python and the monitor lizard. On the shores of the lake, and connected to it by a pier, is a Boat Club, an elegant structure. Bhadaiya Kund, is another picnic spot along a natural spring, the waters of which are said to be rich in minerals, of a curative nature. Bird life in the forests is also plentiful, with many of the species typical of the habitat. hire.Shivpuri has a hot summer, a rainy monsoon season and a chilly winter. Summer temperatures range around 36 °C from April to June. During the monsoon, the weather is milder but wet from July to August and the winters from October to March are pleasant during the daytime when sunny but nights are cold.